Please note:FreeBSD supports only the console version of the utility. 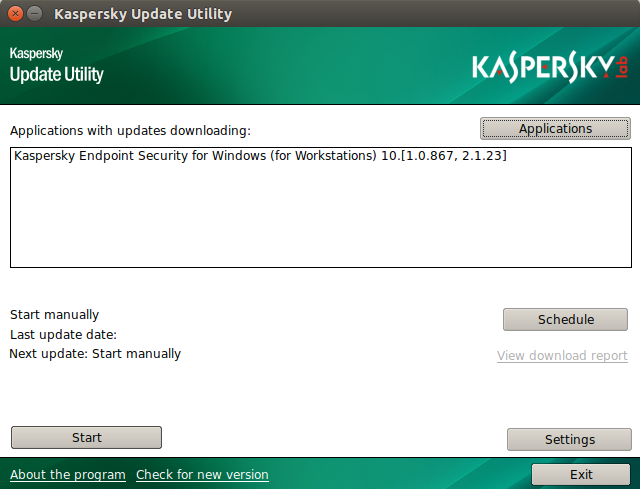 The main application window contains the list of applications for which the updates download is selected, the Start button, and three configuration buttons: Applications, Schedule, and Settings. 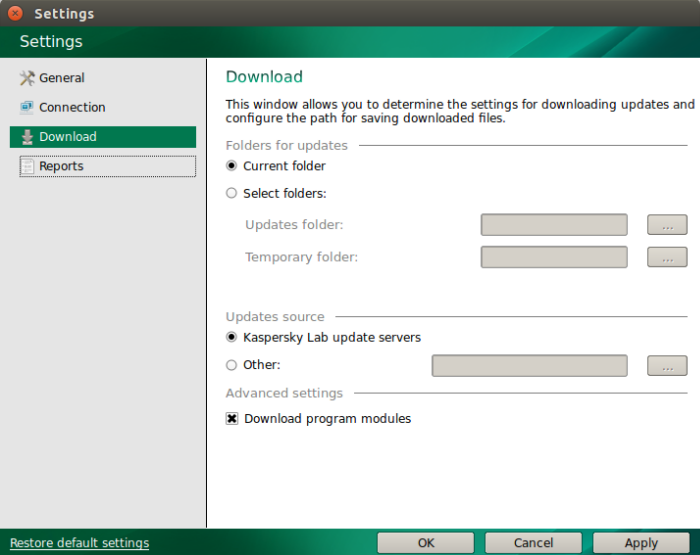 In the Applications window, you can select the Kaspersky Lab products for which you would like to download updates. The products are divided into the following categories: Home products, Workstations, File servers and Virtualization, Mail systems, Perimeter defense, Administration Tools, and Mobile devices. Please note: Due to large size of antivirus databases, we recommend selecting no more than two products for the first update download and add more products one by one. If you select many products at once for the initial databases download, the process will take very long time. In the Schedule window, you can set the updates download schedule: Manual, Minutes, Hours, Days, and Weeks. 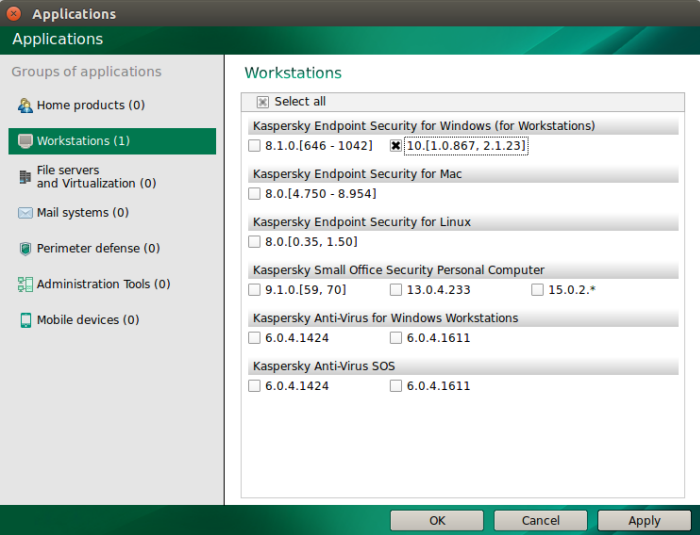 In this window, you can adjust other utility settings. 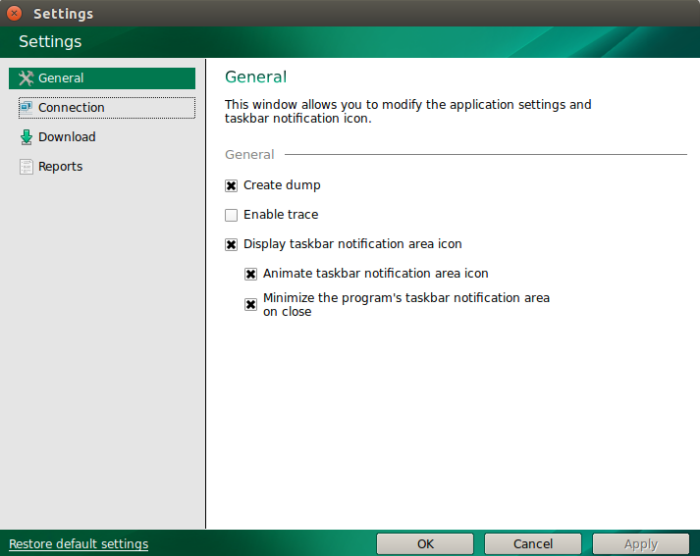 This tab includes the Create dump check box. Dump files help the developers fix the issue in case the utility stops responding or stopping unexpectedly. Also, in the General tab you can enable tracing. Trace files are required by Technical Support to fix issues that occur during databases download. In this tab, you can adjust connection and proxy server timeout settings. In the Download tab, you can specify the Temporary folder, the Updates folder, and the update source. 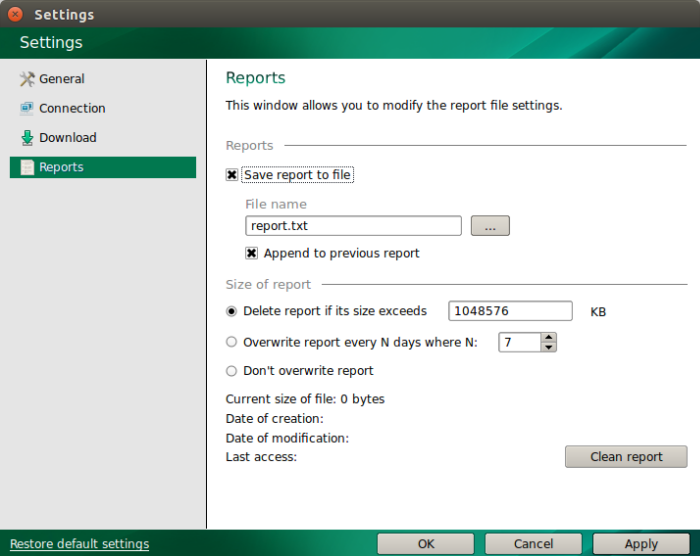 In the Reports tab, you can adjust the utility logs configurations.